Left front: Next Row (WS): Change to larger needles. 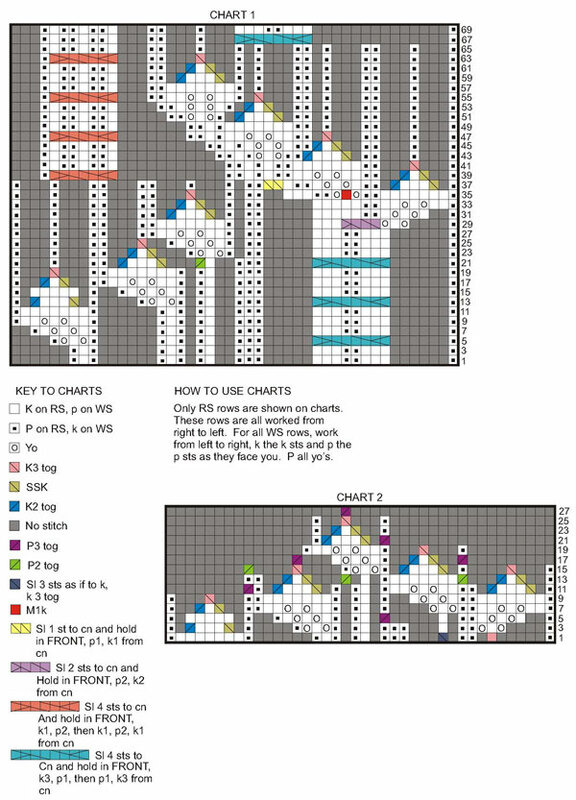 Follow Chart 1 until 70 rows of chart have been completed 3 times, then work Rows 1-10 once more, end on WS. Eyelet row(WS): K3: *yo,p2tog, rep from * to last 3 sts, end k3. After working initial Eyelet Row, inc 3 sts evenly across row--47 sts. Row 1 (RS): With Clover, k4, *sl 3 wyib, k1; rep from * end k4. Row 2: With Clover, k3, p2 * sl 1 wyif, p3; rep from *, end sl1, p2, k3. Row 3: With Clover, knit. Row 4: With Clover, purl. Rows 9-12, with Cranberry Bog, repeat Rows 1-4. Repeat Rows 1-12 six times, then change to Clover and proceed as written in pattern, dec 1 st on Row 1 of Apple Tree pattern.